The Cilantro Fizz at Punch Bowl Social contains chickpea brine. What do an effervescent hibiscus highball, a raspberry-mint cordial, and a frothy cilantro fizz have in common? Aside from occupying cocktail menu real estate at Ticonderoga Club, Donetto, and Punch Bowl Social, these drinks are united by what they lack: booze. As the craft cocktail movement has taken off, so-called “zero-proof” cocktails have evolved from slapped-together afterthoughts to well-considered compositions. While most modern-day cocktail barkeeps have the tools, know-how, and creativity to prepare an interesting, nonalcoholic drink on the fly, more establishments are choosing to invest time in developing zero-proof recipes and are dedicating sections of their menu to them. This is the case at all restaurants in the Charleston-based Indigo Road group, whose properties in Atlanta include Tiny Lou’s, Donetto, and O-Ku Sushi and whose founder, Steve Palmer, has been outspoken about his own recovery from alcoholism. Former Atlanta magazine food editor Julia Bainbridge, whose book on the zero-proof movement is slated to be published by Ten Speed Press in 2020, says granting that kind of menu real estate to nonalcoholic drinks legitimizes them as a worthy, thought-out part of the menu. “In one sense, this is the final frontier; we’ve perfected every other component of restaurant menus, down to bread programs,” she says. It can be challenging to build a nonalcoholic drink that can stand up to a boozy cocktail in terms of complexity and backbone. What makes for a good one? “As with any cocktail, you want a balance of sweet, tart, and bitter,” says Bainbridge. Housemade syrups frequently make their way into nonalcoholic drinks to add sweetness, viscosity, and unexpected flavor combinations, such as the ginger and tarragon syrups in Tiny Lou’s limeade. At Donetto, the standout zero-proof drink, according to beverage director Jordan Moore, mixes a housemade raspberry-mint cordial with ginger beer. And while bartenders often reach for citrus to add acidity, those at King & Duke make use of verjus, the tangy juice of unripened grapes, for the distinctive tartness in the Truer Than True, which also has ginger beer and freshly juiced apple. Much like with alcoholic beverages, a pinch of salt or a drop of saline solution will draw out flavors (there’s a reason you find salt on the rim of your margarita). One of the nonalcoholic options on the menu at Leon’s Full Service, Vinny Vinny Veitch-ee, riffs on a classic Paloma with salted grapefruit and passion fruit juices. And at Ticonderoga Club, which rolled out a brief but thoughtful list of “booze-free” offerings last year, salt adds nuance to ginger, lime, and hibiscus in the Saline Sibling. Other creative ingredients in booze-free drinks can create unusual texture. The Cilantro Fizz at Punch Bowl Social contains chickpea brine, which mimics the meringue-like texture of egg white when shaken. 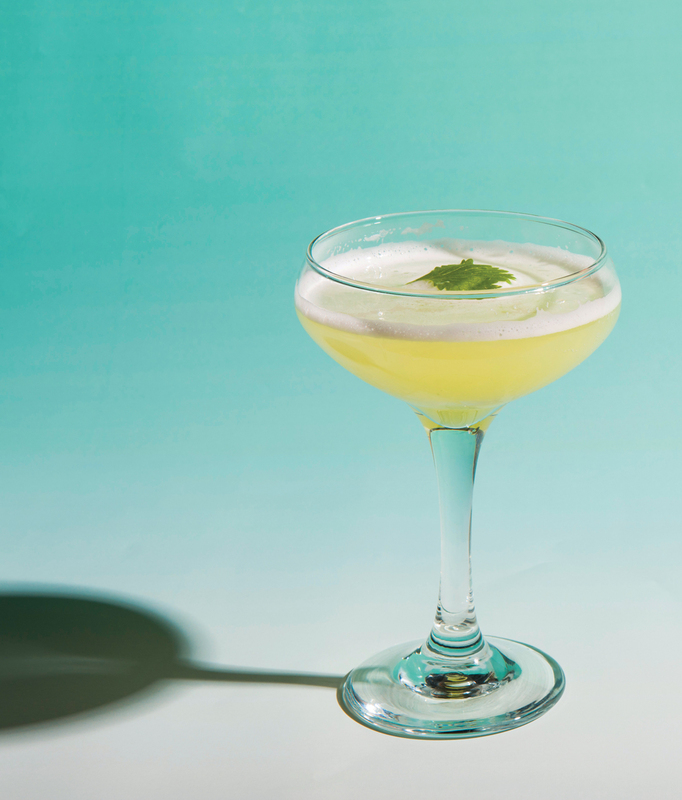 The result resembles a gin fizz—and, unlike an egg-white cocktail, this one is vegan.